"Our Bajio Logistics Center is in an ideal location to support the logistics needs of auto makers and suppliers and builds on our existing strengths and capabilities," said Kunihiko Miyoshi, Chief Regional Officer, Yusen Logistics (Americas). 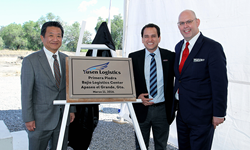 Yusen Logistics, a leading third-party logistics provider, announced the start of construction of a logistics center near Celaya, Mexico, to meet the growing demands of its domestic and international automotive customers. The company celebrated with a groundbreaking ceremony in Apaseo el Grande, Guanajuato, on March 11, 2016. 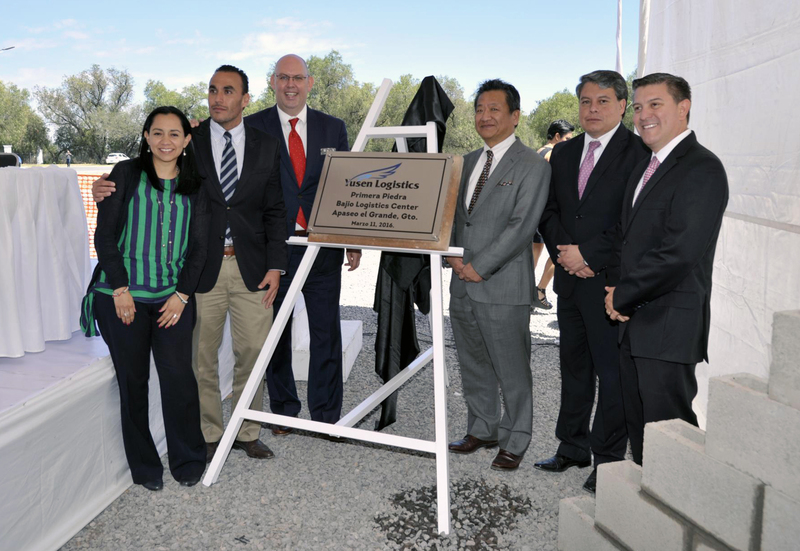 Kunihiko Miyoshi, Chief Regional Officer of Yusen Logistics’ Americas Region, presided over the event, which was attended by officials and representatives from the Guanajuato governor’s office and the office of the Celaya mayor. The 53,820-square-foot warehouse is strategically located on a 17-acre site in the world-class Amistad Industrial Park in the Bajio region, one of the largest automotive clusters in Latin America. The industrialized area offers access to a highly-developed road and rail network, and strengthens Yusen Logistics’ global capabilities to offer automotive supply chain solutions to OEMs, as well as Tier 1 and Tier 2 suppliers, conducting business in Mexico. Services include just-in-time scheduling, domestic truck, rail and intermodal transportation, international freight forwarding, project cargo, import/export services, warehousing and value-add services, and trade compliance. The warehouse, slated to be operational by the end of 2016, will feature 10,764 square feet of office space, 10 dock doors, a large trailer yard and an ocean container depot. There is room for expansion, including the capacity to double the amount of warehouse and office space and add a cross-dock facility with 30 dock doors. Last year, Yusen Logistics (Mexico) S.A. de C.V. launched an Automotive Logistics division in Celaya, Mexico, and established a customs office in the Mexico City Airport, as well as a cross-dock office for air exports outside the airport. The company also arranges significant U.S./Mexico cross-border rail and trucking for its customers and partners with its affiliate, Yusen Logistics (Americas), which operates a 100,000-square-foot warehouse in Laredo, TX. Yusen Logistics is a global logistics and transportation provider that delivers custom supply chain solutions through one of the largest air, ocean and land transportation networks. We have over 475 offices in 40 countries, with more than 20,000 employees at your service. Combining our services gives you greater control over your supply chain. For more information, visit http://www.yusen-logistics.com. Yusen Logistics Builds Logistics Center to Expand Service in Mexico Auto Market The Yusen Logistics (Mexico) team, from left: Fabiola Flores, Human Resources Manager; Jose Coeto, Director, International Division; Jordan Dewart, President, Yusen Logistics (Mexico); Kunihiko Miyosh Kunihiko Miyoshi, Chief Regional Officer, Yusen Logistics (Americas), and Jordan Dewart, President, Yusen Logistics (Mexico), lay the foundation stones of the warehouse.